WhiMSy love: We've only been here 2 days? We've only been here 2 days? Today we drove around Omaha, seeing North Omaha, South Omaha (Little Mexico), Midtown, Old Town, Downtown. 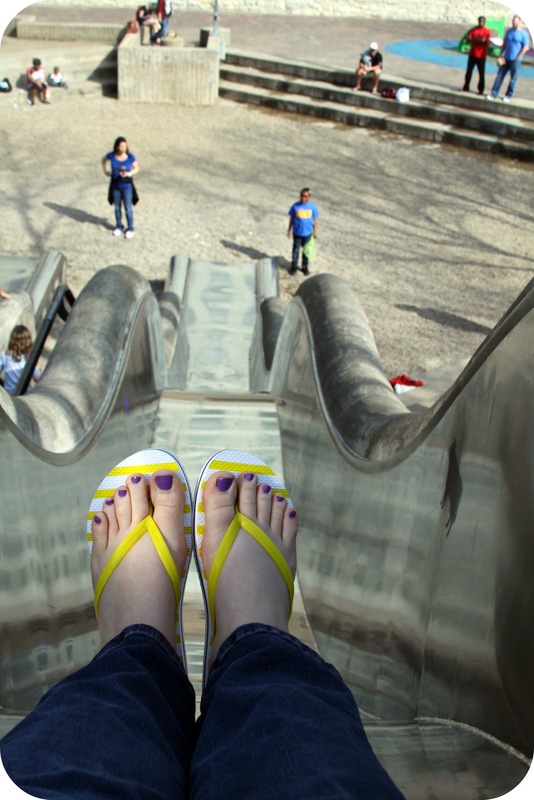 And then we pulled over to scour Glenn Leahy Mall (not shopping) to find this slide that my blog friend Amber told us about. It was AMAZING!! 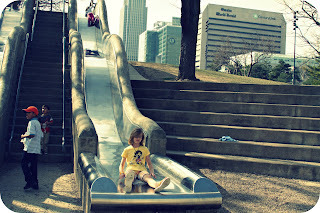 She told us to bring wax paper to go faster down the slide, but we didn't have any. So we looked in the trash & found some. haha! And just an FYI. The slide on the left (if you're looking down the slides) is the faster one. I screamed & scooted my way down. It was so fun! I wished I had a whole roll of wax paper to wrap myself in. HA! 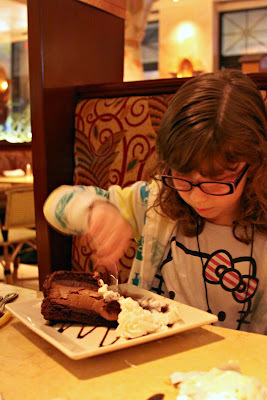 For dinner, we ate at The Cheesecake Factory. Oh. My. Golly. It is so yummy. I think I've only been to a Cheesecake Factory once before, in Scottsdale, AZ before the Mr. & I were married. And I thought it was OK then. But this time, we were all having the most deliciously scrumptious time! We ordered avocado egg rolls for an app. (Seriously, we all high-fived after we ate them.) For dinner I ate the crispy chicken costoletta. (AMAZING. It was served with a delicious lemon sauce, along with mashed potatoes & asparagus.) Scott had the grilled shrimp & bacon club sandwich, Pazely had mini corndogs (they were cute, like corndog lollipops), & Zoey had bowtie pasta with meat sauce. The funniest thing was after dessert (slices of Hershey Chocolate Cake Cheesecake & Reese's Peanut Butter Chocolate Cake Cheesecake) the Mr. put his head in his hands & sat there wondering how he was going to get himself out of there. We were SO full! But every bite was delicious. We all decided The Cheesecake Factory was our favorite place we've eaten so far on our spring break vacay. Well, Pazely said Burger King was her favorite, until she had dessert. Then she changed her mind. I can't believe we've only been here 2 days. It seems like we've been here longer. We are going to bed earlier & earlier each night. I think tomorrow we might have to take it easy. I love reading about your adventures! Sounds like yall are having fun and that slide looks amazing!